There is just something about every wedding I’ve photographed that has hired a live band. The energy is different; it’s alive, pulsating with excitement. By the time the floor opens up for guests to dance, the serious part of the day is done. It’s likely that most guests have had a few drinks, loosened up, and are ready to go! I’ve seen first-hand how, with one chord of a guitar, a quiet dinner service transformed into the ULTIMATE dance party. Over the seven years that I’ve been photographing weddings, I’ve seen a lot of bands. From Washington DC to Abu Dhabi, Kiawah to Carrolton, I’ve had the pleasure of watching people spend time with their nearest & dearest, having an evening they won’t forget. It’s one of the best parts of being a wedding photographer— seeing people have FUN. As most people know, music sets the tone of the evening. A bad band or DJ, or even a jaded one, can totally ruin the vibe of your evening. (Sadly, I’ve been witness to this more than once). It’s best to research the options you have available to you. Think about the atmosphere you want, the guests you’re inviting, and consider whether or not you want to have something super tailored to you, or something everyone will enjoy. Live music is almost always going to be pricier than a DJ, but if your budget allows for it, I say go with the band. There’s quite a few bands out there that you can choose from. I’ve created a list of bands I’d recommend to any couple looking for musicians who are fantastic at what they do. These are bands I’d hire for any event I needed music for. With bands that cover nearly every genre, there is something, or someone, for every couple. Last May I had the pleasure of working with them at a wedding, and I don’t think I’ve ever seen people have more fun than they did at that reception. 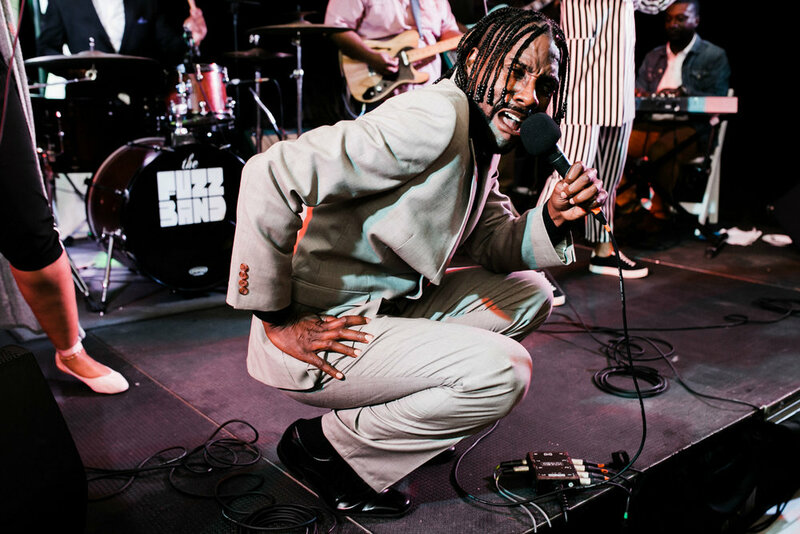 The Fuzz bring nonstop energy, fun, and SASS. They’re also super, super cool. Being that they are based in Hampton Roads, I’ve had the opportunity to see them a few different times and at a range of venues. I’ve seen them play jazzy cocktail hours and packed bars, giving their all to funk, soul, and rock tunes they perform. Their stage presence, how they interact with their fans/guests, how gracious they are, and their obvious talent put them in a league of their own. If you book them, make sure you include Prince on your playlist. You won’t be sorry. A few years ago I had a bride ask me what band I recommended for her wedding at the Inn at Warner Hall. That particular bride really stressed how important it was for her reception to be a big party, and that she wanted her guests to have fun. Without hesitation I said The Deloreans. She hired them, and it was a night to remember. Another local favorite, The Deloreans have been together quite some time. That means that they know their stuff, put on a flawless show, and are fantastic to work with. The guys and gals that make up the band specialize in 80’s music, but I’ve seen them perform a range of songs, and have even learned some for couples— seriously impressive. Like The Fuzz Band, these guys bring ALL the energy. They even get into character with their outfits, which just take this band to a whole new level. Don’t hire them if you want your guests to keep their seats warm. Or if you cannot handle the thought of all your friends and family singing in unison to some of the best music of the decade. If I’m being really honest here, when I first heard about Good Shot Judy, I thought they’d be jazzy, chill… music not necessarily for a wild night of dancing. I encourage everyone to see these guys in person to see just how much they offer, how much they put into their music, and I dare you not to shake your tail feathers! I think Good Shot Judy is a band that would be an especially good choice for a couple like Ann and Tony, who have a lot of family spanning many ages. When I photographed Ann and Tony’s wedding, there were guests young and old on the dance floor with the biggest smiles, having a blast. While Inside Out Band are newer to me, I was so impressed by this Richmond-based ensemble when we worked together for Rachael & Nelson’s wedding, that I knew I had to share. They are consummate professionals, and OUTRAGEOUSLY easy-going. They’ve got jazz, swing, classic rock, Top 40, and even country songs in their repertoire, making them super versatile, and able to play from cocktail hour until late in the evening. Bottom line? If you want a crowd-pleasing band that can do it all, Inside Out Band is who you’ll want to book. The 919 Band isn’t technically based in Virginia. They’re based in Raleigh. However, they will travel! I’ve worked one wedding with them, and they were so notable I decided to include them here. This band has a HUGE song list with something for everyone. I’ve only ever photographed a wedding with Cheap Thrills as a second photographer, but the weddings/events I’ve been to with them have been AWESOME. Not unlike The Fuzz Band and The Deloreans, Cheap Thrills have been around for quite some time. They’re seasoned pros, and their music and showmanship reflect that. They’re always a solid choice. Not looking for a full band, but still want live music? 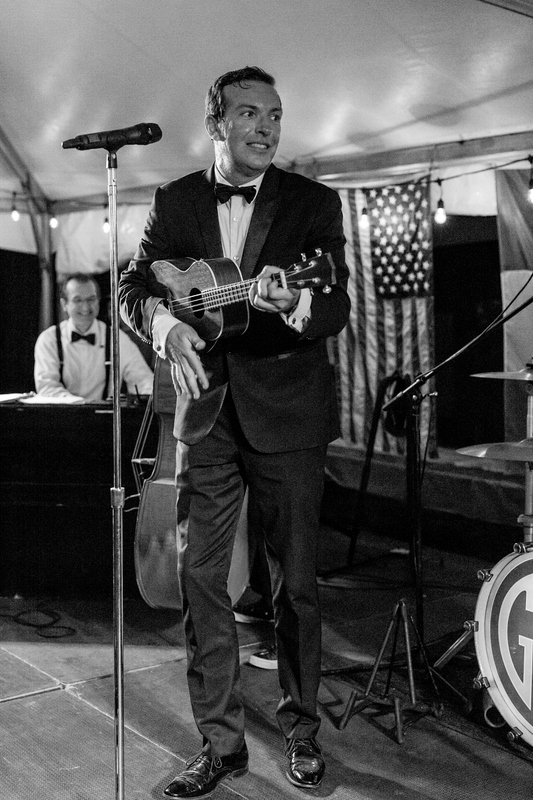 Jesse Chong’s sweet, soulful voice and laid back personality are the perfect combination for a relaxed couple, intimate ceremony, or for something a little smoother during cocktail hour.